faces east toward a stunning sunrise each morning. who want their children in a separate cabana. Airways, Delta and TACA fly in to Belize City. drive. It is also a great way to travel Belize. door. There are many delightful shops with local arts and crafts. of the reef fish, crabs, rays, and tropical schools of glowing fish. to the pier or drive by the cabanas... and so much more. provided, washer & dryer, bicycles. Free high speed DSL/WiFi Internet. 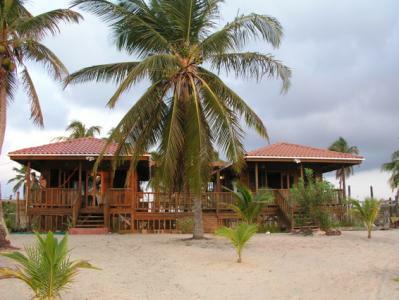 $1095/week (Jun 1-Oct 31), both cabanas for 4 people, 3 night minimum. $1395/week (Nov 1-May 31), both cabanas for 4 people, 3 night minimum. Additional persons (over age 12) are 10% per week. 9% Belize Hotel Tax, NO SERVICE CHARGE. Partial weeks (3 night minimum) or additional nights are pro-rated. Full Payment required 60 days prior to stay. Visa, Mastercard & PayPal accepted. prior to arrival. If 45 to 30 days prior 50% refund. illness, weather or any other act over which we have no control.